Welcome to tropical Sydney, where colourful surgeonfishes and parrotfishes are plentiful, corals have replaced kelp forests, and underwater life seems brighter, more colourful and all-round better. Or is it? While this vision of a future Sydney is just an embellished cartoon of what climate change would do off the city’s coastline, our recent research does point to a widespread “tropicalisation” of temperate coastlines such as Sydney within the next few decades. This may sound pleasant, but it can lead to unwanted consequences. 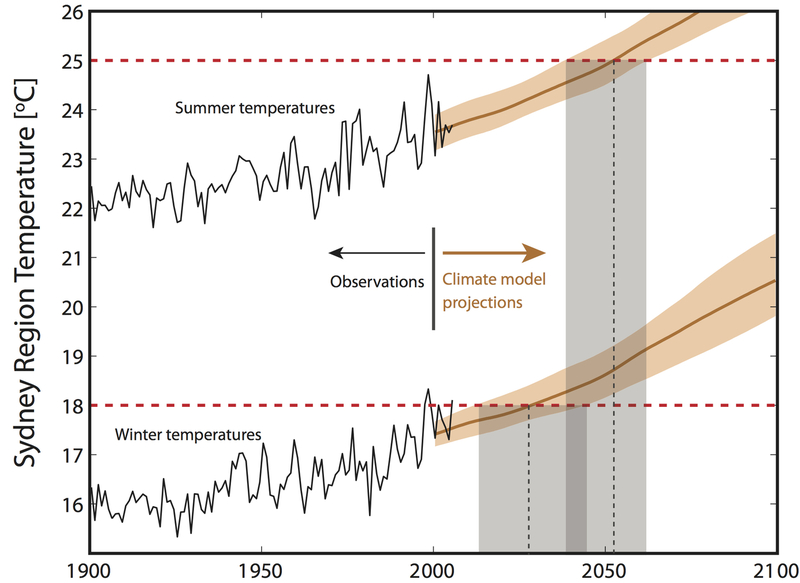 Climate models suggest that ocean temperatures off Sydney are just decades away from becoming “tropical”. 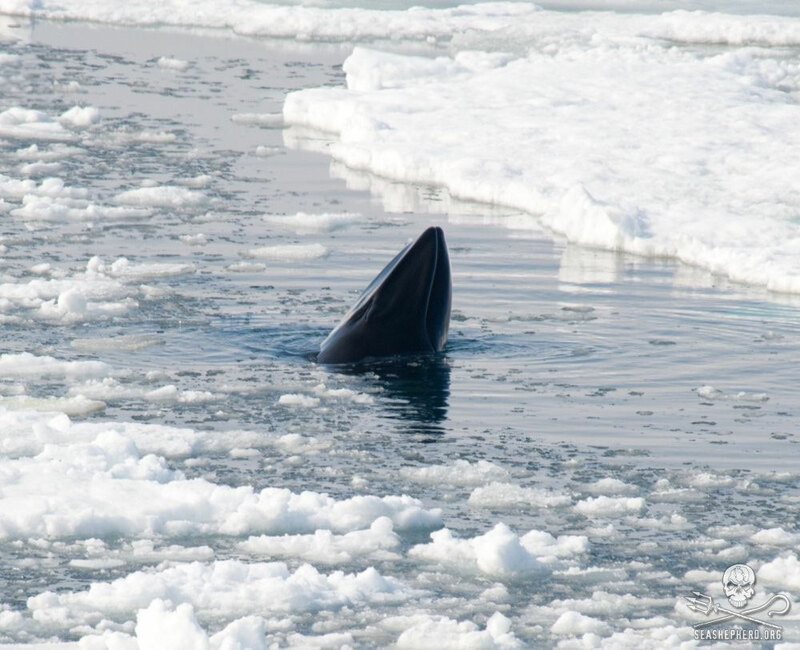 A “business as usual” scenario of increasing CO2 emissions suggests winter sea surface temperatures will consistently exceed 18 degrees C between 2020 and 2030. 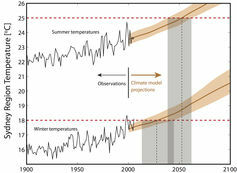 And summer sea surface temperatures will consistently exceed 25 degrees C between 2040 and 2060. Eastern Australia waters represent a climate change hotspot, with warming rates occurring twice as fast as the global average. A key reason for this is a strengthening of the East Australian Current, which pushes warm tropical water southwards. Other oceanic hotspots around the world include southern Japan, south east USA, south east Africa and eastern South America. All these regions have in common the influence of strong ocean currents running close to the shore bringing warm tropical water. So what will warmer ocean temperatures do to Sydney? Examining what’s happening within these other hotspots can help us to make some predictions. In our study, recently published in Proceedings of the Royal Society B, we show how tropical fishes are becoming increasingly abundant in many warming hotspots. Indeed, tropical fishes are already a common feature in Sydney during the late summer months, and some have even started to survive over winter. And fish are not the only organisms moving. Tropical corals have also started to make their way down the NSW coastline, and researchers are now on the look out for them in the waters off Sydney. Nobody would complain if the only consequence of climate change was more species of marine life — greater biodiversity. However with these gains also come substantial losses. And the biggest losers are underwater algal forests. Canopy algae, or seaweeds, are the linchpin of temperate coastlines. They provide food and shelter to hundreds of species, and fulfil a role similar to trees in terrestrial forests. However algal forests need relatively cool water to survive, and this is becoming increasingly elusive in these regions. A dramatic example of warmer water on algal forests occurred during the extreme ocean heat wave off Western Australia associated with the massive La Niña in early 2011. Extreme ocean warming lasted only a few weeks, caused an unprecedented decline of algal forests and the temperate marine life communities they support. So why is warm water damaging to algal forests? There are a few reasons. High temperatures can directly stress algae by damaging the machinery that supports their survival. Warmer tropical water also carries fewer nutrients, which the algae need to grow. And now our research is uncovering a new mechanism leading to the loss of algal forests: increased grazing by the very same tropical fishes that we were initially so happy to see along our coastlines. 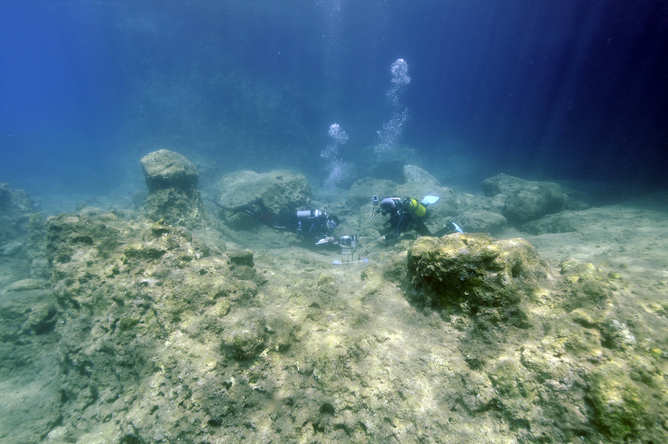 The harmful effect of warm-water fish on temperate reefs is most evident in southern Japan and the eastern Mediterranean, where algal forests have dramatically declined. In a paper published last week in the Journal of Ecology, we show how the invasion of tropical rabbitfish in the eastern Mediterranean has created eerie barren areas extending over hundreds of kilometres. These new habitats support less than half the species found in the nearest algal forests. Similarly, off southern Japan over 40% of algal forests have disappeared since the 1990s; a phenomenon known as isoyake. 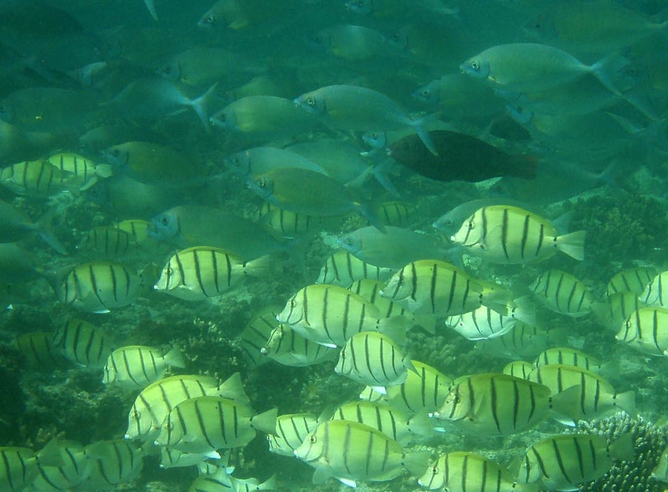 Increased annual grazing rates by tropical rabbitfish and parrotfish appear to be the primary culprit. 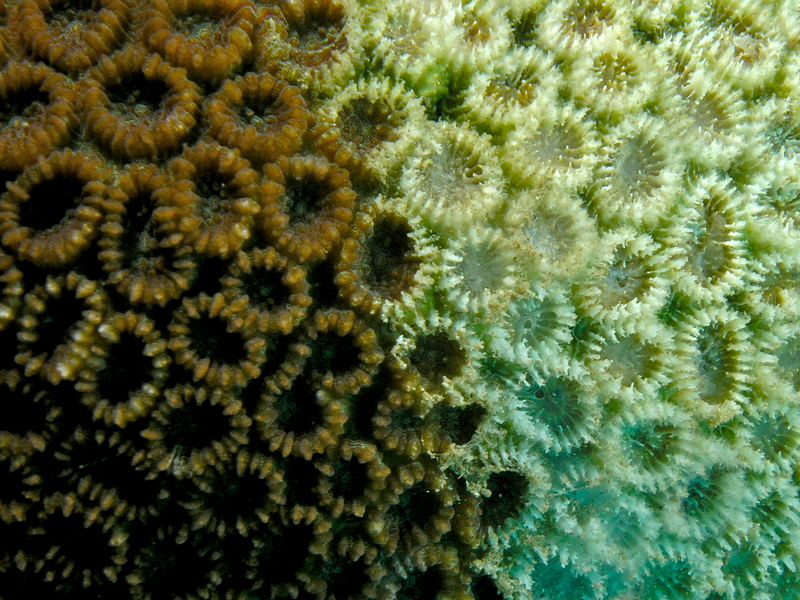 Now corals dominate at many sites. Japanese people are famous for their love of algae — they have dedicated shrines and eat them with nearly every meal. Consequently there is considerable concern over their loss. It has also resulted in the complete collapse of abalone fisheries, and the cultivation of other commercially important species such as the Japanese amberjack is becoming increasingly difficult. Algal beds have already been replaced by corals in Tosa Bay (Southern Japan). 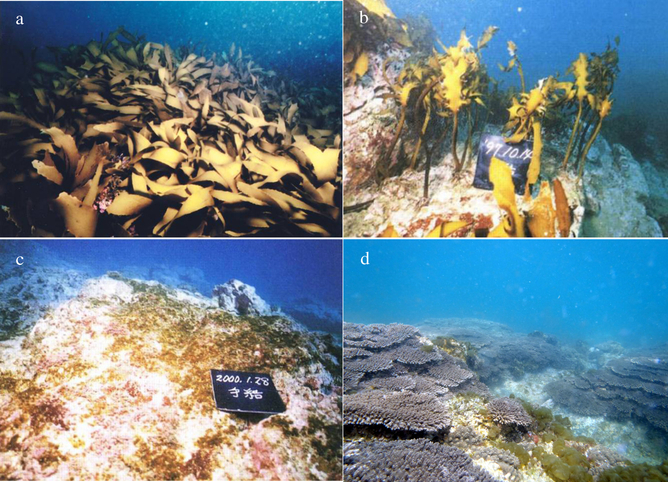 a) Abundant algal forests in the early 1990s; b) overgrazed algal beds in October 1997; c) Rocky barren area in January 2000; d) Coral communities present in January 2013. (a-c) Zenji Imoto, (d) Yohei Nakamura. So what can we do to stop temperate algal forests turning tropical? To prevent further dramatic changes we ultimately need to reduce our CO2 emissions. In the meantime, we could also encourage new fisheries in temperate reefs that target tropical fishes. 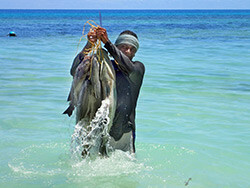 Rabbitfish, for example, are considered a delicacy in many Indo-pacific countries and already make up a sizeable component of fisheries catches in the eastern Mediterranean. AUSTRALIA 2025: How will science address the challenges of the future? In collaboration with Australia’s chief scientist Ian Chubb, we’re asking how each science discipline will contribute to Australia now and in the future. Written by luminaries and accompanied by two expert commentaries to ensure a broader perspective, these articles run fortnightly and focus on each of the major scientific areas. In this instalment we dive into marine science. Why are our oceans important to us? How is our health, the health of the environment, the strength of our economy and indeed, our future, dependent on the seas? How can marine science help us, collectively, to sustainably develop our marine-based industries and at the same time protect our unique marine ecosystems so that they can be appreciated and enjoyed by future generations? In many ways, Australia is defined by the oceans that surround us. We have the third largest ocean territory in the world. The majority of our trade travels by sea, vast offshore oil and gas resources earn vital export income and offer a long term, cleaner energy source than coal and our fisheries and aquaculture industries provide healthy food. We are custodians of two magnificent marine World Heritage Areas – the Great Barrier Reef and Ningaloo Reef – and we are a nation that loves to sit by, swim, surf, dive, fish and sail in the (mostly) clean waters and healthy marine ecosystems that surround our continent. Australia’s affinity with our ocean estate is perhaps best exemplified by the fact that 85% of our population lives within 50km of the coast. 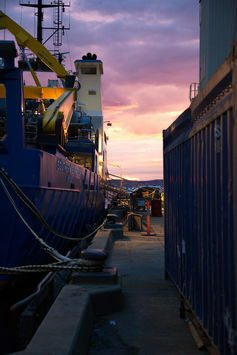 Marine industries contributed approximately A$42 billion to our economy in 2010. This is projected to grow to approximately A$100 billion by 2025 with the expansion of current industries and development of new opportunities in areas such as renewable energy. As a nation we will increasingly be dependent on our “blue economy” for our future prosperity. In addition to their economic and aesthetic value, our oceans also provide a suite of essential “ecosystem services” – most importantly in their role within the global climate system. Since the end of the 18th century, about 30% percent of human-induced carbon dioxide emissions have been taken up by the oceans while over the past 50 years, they have absorbed about 90% of the extra heat generated through the impacts of the greenhouse effect. The moderating influence of the oceans as our planet warms, and their very strong influences on our island continent’s weather, impact on every Australian, every day. If Australia, and indeed the world at large, is to continue to enjoy and grow the benefits accrued from our oceans, we need to face up to and meet a number of significant (and in some cases urgent) challenges. 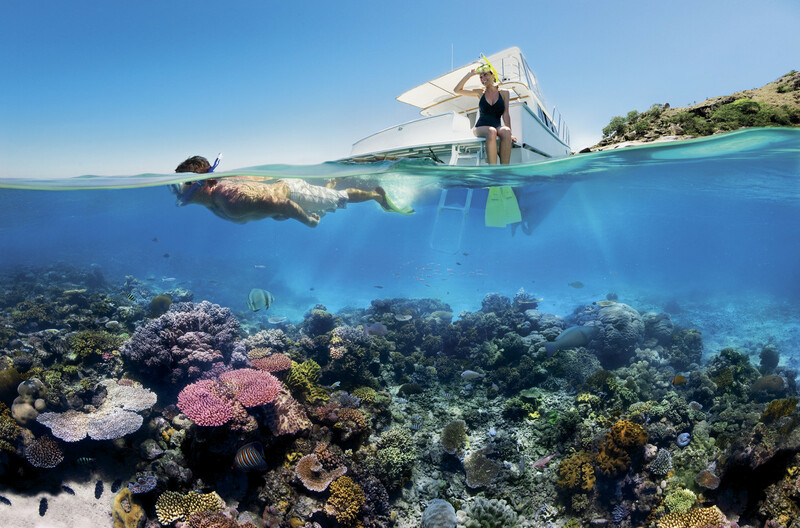 Australia’s marine science community recently collaborated with governments, not-for-profit organisations and the private sector to produce the report Marine Nation 2025: Marine Science to Support Australia’s Blue Economy. optimal resource allocation: needs integrated social, economic and environmental information and tools to assist transparent, robust and accountable decision-making. The multidisciplinary nature of marine science, the geographic scale and connectedness of marine systems, and the complexity of the challenges above mean that in the majority of cases no one institution (or in the case of industry, one company) can build the evidence base or tools required to adequately address these challenges, even at local scales. Thus, a dedicated and coordinated effort across our national marine science community, governments and industry is required. Coordination can (and should) ensure that resources are used efficiently and strategically, and allow the full breadth of the marine science community – from the fundamental work conducted across the university sector, to the translational and applied science conducted by national science agencies such as CSIRO, Geoscience Australia and the Australian Institute of Marine Science (AIMS) – to have the maximum impact. A couple of recent cases illustrate of how strategic, collaborative efforts across organisations and sustained investment in national-scale infrastructure provide vital support for decision makers across government and private sectors. CSIRO oceanographer David Griffin has been involved in the search for Malaysian Airlines flight MH370 this year. He used advanced models of ocean currents around Australia developed through a collaboration between CSIRO, the Bureau of Meteorology and the Australian Navy over the past decade, to determine likely movement of wreckage and allow search and rescue operations to pinpoint their activities. The same models can also be used to track and predict oil spills, missing boats, valuable fish stocks and guide Navy operations. The critical data required by the models comes from Australia’s Integrated Marine Observing System (IMOS), a national, collaborative infrastructure facility set up eight years ago. IMOS has become an international leader in ocean observing and is now the critical observational foundation for much of Australia’s marine science. Two strategic and sustained marine science investments – in ocean observations and modelling – provide the fantastic capability for David’s work, and many other applications to come. Similarly, following the UNESCO World Heritage Committee’s questions about our management of the Great Barrier Reef World Heritage Area, Australia’s response has relied heavily on the body of evidence provided by strategic investment in marine science conducted over the past 30 years. Science doesn’t always tell a good news story – the AIMS long term monitoring has shown that half of the Great Barrier Reef’s coral cover has been lost over the past 27 years due to the cumulative impacts of cyclones, Crown of Thorns starfish and bleaching (caused by heat stress). Importantly though , the research conducted by AIMS, the ARC Centre of Excellence for Coral Reef Studies (lead by James Cook University) and others also provides the evidence base for understanding ecosystem health and development of policy and regulation to stop the decline and rebuild the reef. Australia has world class, and in many areas world leading, marine science capability. Appropriately, over the past few years the marine science community has recognised the need to work together and is increasingly collaborating in providing big-scale science focused on national and global needs. But if we are to rise to the challenges of our growing “blue economy”, we will need to do much more. We will need to take a long-term outlook and focus effort on both the development of science capability (human and physical) and securing the best possible returns to Australia through its effective coordination and utilisation. direction of greater effort into communicating the relevance and benefits accruing from marine science, to ensure optimal awareness and uptake in policy, legislative and regulatory domains. Marine sciences deliver data and modelling on oceanographic patterns benefiting weather forecast and maritime safety, provide information underlying sustainable seafood harvesting and production and knowledge on marine life underpinning biodiscoveries. Yet it is a challenge to carry out marine research throughout the huge realm of Australia’s maritime jurisdiction. Australia has only a small fleet of research vessels for coastal and offshore waters and needs a better alliance of shore-based marine field stations. Ocean exploration relies on technological innovations. 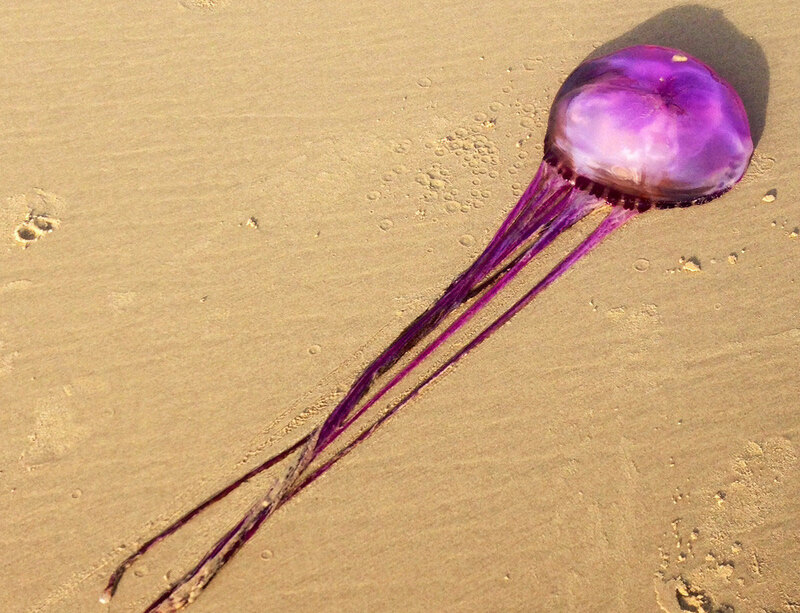 As much of the oceans are still unexplored, curiosity driven research can provide useful discoveries such as alternative products to benefit human health. The Census of Marine Life illustrated the highly diverse marine life in Australia’s seas, but taxonomy is a threatened skill unless the tide turns for museum research funding. Rigorous experimental hypothesis testing, using shore- and sea-based facilities equipped with operating funds, technical and research staffing, can support mitigation of cumulative impacts and global warming. Marine research strengthens monitoring into the health of Australia’s seas facing growing economic use, the effectiveness of marine protected areas and biosecurity of marine invasive species. Understanding marine ecosystems requires multidisciplinary approaches and a well-connected network of scientists. At times of highly competitive research circumstances, appreciation for collaborative skills has to increase. Higher education in marine sciences, including maritime engineering, provides an informed and versatile work force to address challenging scientific questions and generate knowledge for decision making on the wise use of the seas around us. Continued participation in international programs on ocean exploration will strengthen Australia’s position as a leading nation for marine sciences. 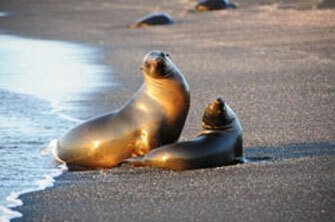 The global ocean is humankind’s common heritage and responsibility. Ocean under Australian jurisdiction is significantly larger than the nation’s landmass. Our 0.3% of the world’s population is custodian for 3.8% of the world’s ocean, by far the greatest responsibility per capita among the G20 nations. the soundscape of the 98% of the ocean beneath the surface zone, where light doesn’t penetrate and most life uses sound as its primary sense, is virtually unknown. Australia’s vital and growing blue economy critically depends on understanding and managing the sea, through both national efforts (such as the Integrated Marine Observing System) and international partnerships (such as the International Ocean Discovery Program). But much of the nation’s capability in the three pillars of marine research — observation, experimentation and modelling — across the major marine scientific disciplines — biology, chemistry, geoscience and physics — is precarious due to short-term and therefore vulnerable support. In the context of a to-be-developed national strategy for marine science, increased and sustainable investment in exploratory, basic, applied and translational marine research — in both human capability and infrastructure — as well as improved underpinning primary, secondary and tertiary education in science and mathematics are needed to ensure a healthy, productive and resilient ocean for present and future generations. Scientists from The Australian Institute of Marine Science (AIMS) and the University of Western Australia (UWA) are leading research into using smart technology to learn more about the migrations of the world’s largest marine animals. While tracking animals began in the 1950s, in contrast, studies of human mobility have only been a very recent development. These studies are made possible by the fact that we carry our own personal GPS system – a smart phone – which over time generates huge datasets about human behaviour. “For example, early satellite tracking data from albatrosses was an inspiration for the study on how humans move in the environment. Even though our discipline of studying animal movement has been around longer, it has been overtaken in terms of advancements given the access to large data brought about by the internet and smart phones. Data sharing would allow us to reach the same level of understanding,” said AIMS Research Scientist and UWA Adjunct Assistant Professor, Dr Michele Thums. 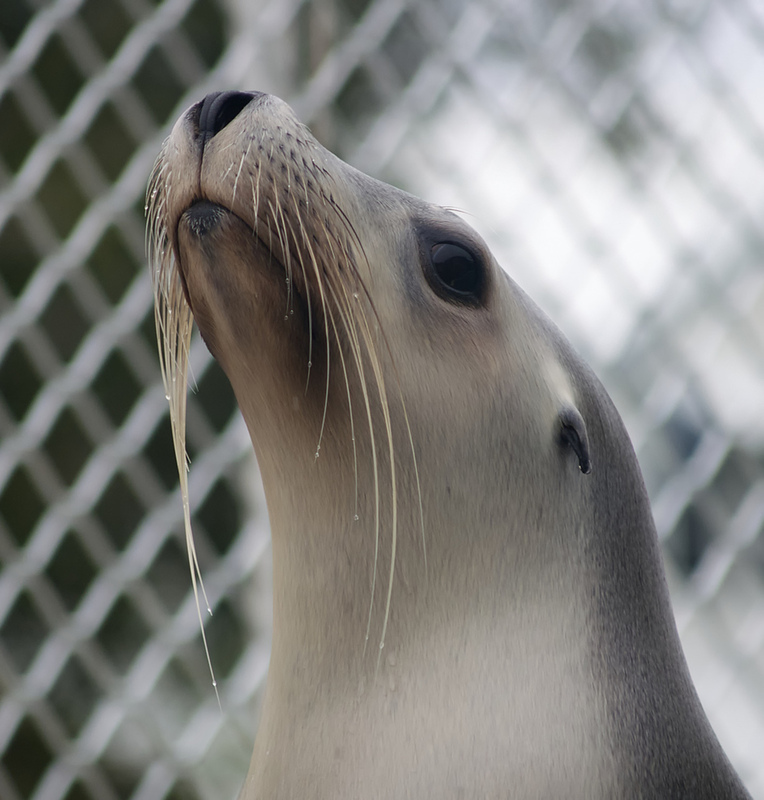 A group of renowned national and international multidisciplinary researchers, including physicists, animal biologists and ecologists, will attend the ‘Marine Megafauna Synthesis Group’ workshop in Perth next week to share their data and work together to compare the movements and behaviors of these animals on a global scale, using novel approaches from the study of human mobility. Thums explained that collaborative research group presented a unique approach to advancing knowledge about the movements of megafauna worldwide, by data sharing and applying the approaches developed by scientists studying human mobility. 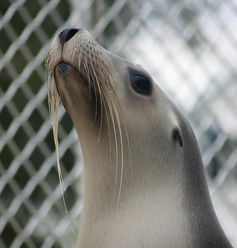 The tracking data from marine mammals, birds, reptiles and large fishes will be collated and synthesised, with the intention of providing new insights into their movement and behavior as well as preparing a road-map for developing a publically available data storage facility for animal tracking data. “Some of the most exciting advances in our field have come from the interaction across disciplines,” said Professor Costa. Reef historian Iain McCalman, in Sydney, and reef scientist Stephen Palumbi, in California, are monitoring reef degradation from opposite sides of the planet. They compared notes. Iain McCalman: A recent report found that the Great Barrier Reef had lost 50% of its living coral. This was mainly from cyclones and the damages of Crown of Thorns starfish. Then there are the new threats of coral bleaching and acidification. Are the problems you are finding in the US old ones that have mounted up and intensified? Or are they new challenges coming from human-stimulated climate change? Steve Palumbi: All coral reefs in the world suffer from the same problems – they’re smothered by sediment, choked by weedy algae, blasted, dug up and stripped of most of their fish. Then there’s climate change making the oceans hot, sour and stormy. 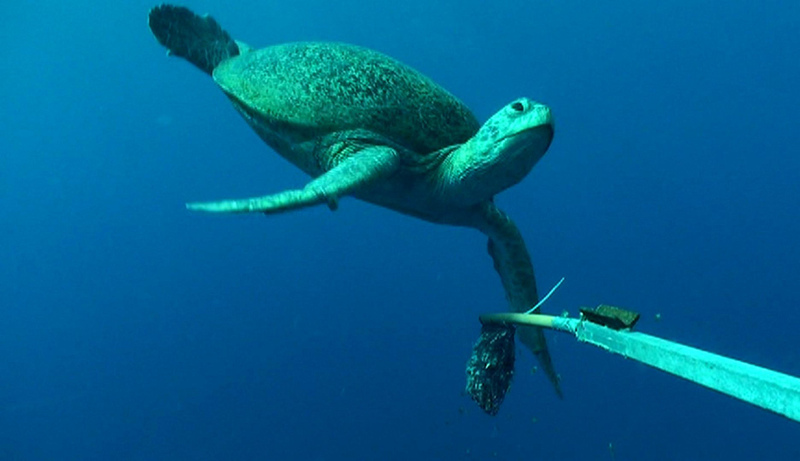 Worst off are the reefs of the Caribbean, suffering from more than 500 years of incremental impact from western civilization, mostly in the form of poor stewardship. But even the far-flung reefs of the Pacific that the US manages have some combination of local stresses. It seems to me that what the Great Barrier Reef has – that US reefs do not – is a central place in the hearts and minds of the public. Sure, most people in the US like corals and fish, but our reefs have not reached celebrity status. What kind of extra oomph does celebrity give the Great Barrier Reef? Has it been important in keeping it healthy? Iain McCalman: The Great Barrier Reef’s popularity has helped control some things such as tourist pollution and the overfishing of parrot fish that graze on algae and keep corals clean. Yet we haven’t been able to deter our governments from building massive new Reef ports and there are more and bigger coal ports on the way. What worries me, too, is that waters warmed by greenhouse gases will cause big outbreaks of coral bleaching this coming summer, with stressed corals turning white as they expel the symbiotic algae that normally live within them. 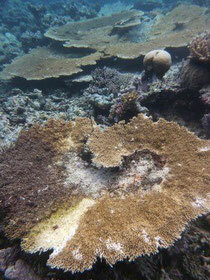 Another one degree or so will hurt corals that have been hit before: this time they may not recover. Steve Palumbi: I’m also worried about coral bleaching. This week along the US Pacific coast we have had record temperatures on land and in Monterey Bay – well, it is still very cold by Great Barrier Reef standards, about 60F (16C), but it is warm for us! And a look at the latest map of ocean temperatures shows a lot of red – these are places where the ocean is 1-2 degrees warmer than the usual annual maximum. Iain McCalman: We are predicting something similar, especially because we seem to be entering an El Niño weather phase when the Pacific is generally warmer anyway, though Charlie Veron, one of our great coral scientists, says that every year is becoming an El Niño year in Australia as far as corals are concerned. Steve Palumbi: Every year is a hot one … that seems to be what the world is seeing across the continents and the seas. Way back when people first stumbled on the fact that corals bleached when the temperature rose too much, they found something else: corals in warmer climates near the equator bleached at a higher temperature than corals living in cooler waters. We have seen this on a small scale in American Samoa where we work, and have shown that individual coral colonies living in warm water acclimate to the heat by changing their physiology. And whole populations of corals adapt to heat by having the right genetic makeup across about 100 genes. Can we use this discovery? Turns out we can in two ways. 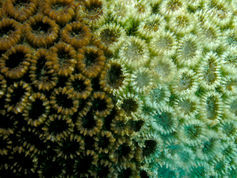 We can locate and protect these heat-resistant corals. And we can try transplanting them to see if they in fact retain their heat resistance. We expect them to lose a little ground. How much is the question. I’d love to think this will give us a leg up in replanting future reefs. I am not sure yet, because reef restoration has been so difficult. Does the Great Barrier Reef have any successful restored, replanted reefs? Iain McCalman: Not that I know of. Moreover, with a government skeptical about climate change, a good deal of the work of this kind on adaptation is being shelved. 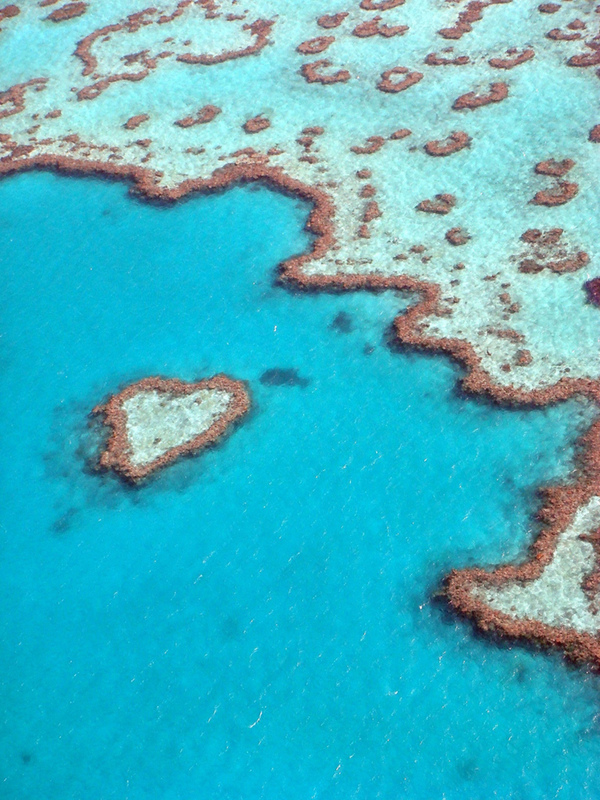 Five of the Directors of the Great Barrier Reef Marine Park Authority recently resigned in protest against the cutting of programs concerned with responding to climate change. Five directors of the Great Barrier Reef Marine Park Authority recently took redundancy packages, among them its former climate change director Paul Marshall, who said budget cuts have left the agency without a dedicated climate program. But I also wanted to ask you about acidification. As the amount of CO2 in the atmosphere rises, oceans absorb more and it turns into carbonic acid in seawater. How do you rate the mounting acidification of the oceans from absorption of CO2 as a threat to corals? It seems to be the elephant in the room: its consequences go beyond endangering corals to threaten other marine species as well. Some scientists seem to think it will deliver the death blow to coral reefs, if other things don’t get them first. What’s your feeling? Steve Palumbi: Acidification is not the elephant in the room yet, it’s the elephant on the bus … due to get here any time now. The best data suggest that acidification has huge effects, from slowing down coral growth to changing the behavior of coral reef fish so that they get eaten more easily. Those effects are not strong yet, but they are coming quickly as CO2 builds up in the atmosphere. CO2 and acidification takes 50 years to reverse. Think of stopping distance – a speeding car takes a long time to stop. So too with acidification. And that is what I worry about. Because by the time the effect of that CO2 is killing corals, it will be too late to do anything about it. It’s like cancer treatment. If you’re lucky, they find a tumor when it is small and maybe isn’t even bothering you. But that tiny tumor is a huge threat, and we jump on it to fix it. But I want to circle back to something you brought up at the beginning. Australia is selling coal to China, I hear. What is going on? Iain McCalman: This issue of coal lies at the heart of current threats to the Great Barrier Reef, and symbolizes an economic mindset that reef lovers everywhere are up against. Our government has decided that Australia’s economic future lies in selling cheap coal to China and India. To do this the Federal and Queensland state governments need to expand existing coal ports on the Reef because these provide the cheapest and quickest shipping routes to Asia. Quite apart from discouraging investment in renewable energy by backing fossil fuels, this decision has fraught implications for the health of the Reef and its waters. Because the reef is too shallow for massive container ships, the new coal ports all entail extensive dredging of the seafloor. Thankfully public agitation has temporarily deflected the government’s original plan to dump three million cubic meters of dredged silt from Abbot Point into the reef channel, where it would choke corals and swamp sea grasses. Even so, dredging will stir up immense amounts of sediment as well as coral-threatening bacteria. 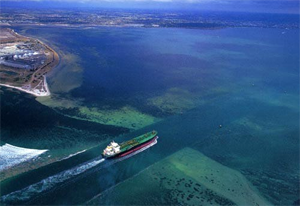 The vastly increased tonnage of container ships churning up and down the tricky reef channel represents a further threat from reef accidents and oil spillages, both of which have occurred a number of times in the recent past. There are plans, too, for several new mega-sized coal mines to be opened nearby, requiring similar access to the Great Barrier coastline and lagoon. To call this policy short-sighted is an understatement. It sacrifices one of the wonders of the world and a substantial economic asset for Australian tourism; and this at a time when even China is trying to wean itself from using polluting coal. The Great Barrier Reef might be an icon for us in Australia, as you said, Steve, but we seem to have governments that are proud to be icon bashers. Steve Palumbi: I am thinking about a wonderful passage in your book, about Captain Cook navigating the Great Barrier Reef’s intricate tributaries, straining his considerable navigational skills to delicately thread his small ship up coral-filled canals. Now blast a modern coal ship through there, and what would you expect to happen? Cook’s ship was threatened by the Great Barrier Reef. Now the tables have turned. I can’t help also to think about one of the last major threats to the whole Great Barrier Reef - the crown of thorns starfish. It wasn’t too long ago that this voracious predator was wasting reefs all along Australia. 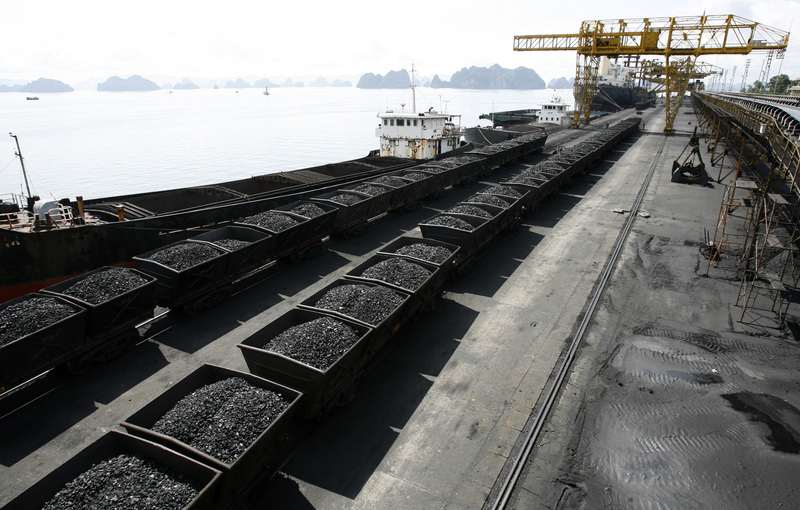 The way you describe the dangers of mining and ports makes me want to call this new threat the Coal of Thorns. The Coal of Thorns may prove to be an even bigger threat - because it is something the reef has never seen and it is on an industrial scale that could threaten even this biggest biological structure on Earth. And all to help China pollute their own air! What happens after you build all these ports, you export the coal and China turns to their vast supplies of natural gas? Dead reef and a dead exporting business. 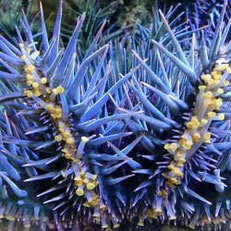 When the coral-eating Crown of Thorns began devastating the Reef in the 1960s, people tried everything to stop it. Folks picked them up by the thousands and burned them. They poisoned them. They fought them up and down the length of Australia. They would have loved to have the problem solved by simply passing a law. This threat from coal is a problem created specifically by people. And it could be solved by people in a way that was never available for the starfish scourge – a simple sign of a pen could do away with this major threat. This article was amended on October 28, 2014, to clarify the circumstances of the departure of the five former directors of the Great Barrier Reef Marine Park Authority. Iain McCalman receives funding from Australian Research Council. Stephen Palumbi receives funding from the U.S. National Science Foundation, the Gordon and Betty Moore Foundation and the David and Lucile Packard Foundation. Shellfish reefs will be re-created on the bottom of Port Phillip Bay in a historic project that aims to improve marine habitats in Victoria’s largest bay. Researchers say that if the reefs can be successfully established as expected, they would provide healthy habitats for shellfish like mussels and oysters. They would also provide habitat, shelter and food options for fish such as snapper, flathead, rockling and many other fish that live in the bay. They would also help improve water quality. Shells from mussels, scallops and oysters that have been discarded by the seafood industry and restaurants could be sought as part of the project. They would eventually be placed in the bay at one of three locations, in order to form a base for the early stage of the shellfish reefs. Some artificial material could also be used. But the project requires more than old shells. Millions of baby oysters and mussels, which will be bred at the Victorian Shellfish Hatchery at Queenscliff, will be used to colonise the reefs in the $270,000 pilot project. The baby oysters and mussels will attach themselves to shells at the hatchery, before they are placed in the water on top of the old shells. The project, to commence this year, is expected to be formally announced on Saturday by Agriculture Minister Peter Walsh, the minister responsible for fisheries. It will be funded jointly, with $120,000 from the state’s Recreational Fishing Initiative, and $150,000 from The Nature Conservancy, an international organisation that undertakes conservation works around the world. 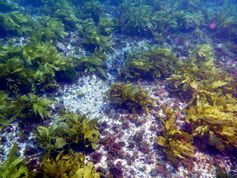 A patchwork of reefs will be restored at three locations, near Geelong, Chelsea and St Kilda, in about eight to 12 metres of water. Paul Hamer, a senior research scientist at Fisheries Victoria, said it was a very exciting project. ‘‘Ultimately we’re going to try and recreate shellfish habitat and shellfish reefs, that were once highly abundant in Port Phillip Bay and provided habitat for a whole range of fish and other marine creatures, like crabs, octopus, squid, mostly invertebrate species. Crabs, other crustaceans, other shellfish that grow on the oysters and the mussels,’’ he said. ‘‘Years ago in the deeper, sub-tidal parts of the bay there were lots of shellfish, lots of shell beds that provided these substrates and these habitats for these animals to live in,’’ Dr Hamer said. But many of the bay’s shellfish reefs had been lost due to dredge fishing of oysters in the 19th century, and in the 20th century, dredge fishing for scallops and mussels from the 1960s to 1990s. ‘‘Shellfish reefs have often been called ecosystem engineers. The oysters themselves create habitat for other species, by providing substrates for other things to settle on. And a whole bunch of little hiding places in amongst their shells for other animals to live and avoid predators,’’ he said. Mr Walsh said the work would occur under a landmark partnership. ‘‘Shellfish beds are recognised as important ecological features of Port Phillip Bay as they can provide key fish habitat valued by both commercial and recreational fishers,’’ he said. James Fitzsimons from The Nature Conservancy said the project would create ‘‘a more structured, robust habitat, which was originally there in the bay and originally there for much of south-east Australia. It’s really re-creating a 3D habitat that we’ve lost in the bay”. Dr Fitzsimons said the group had been involved in about 100 shellfish reef restoration projects in America – experience which would help this project. 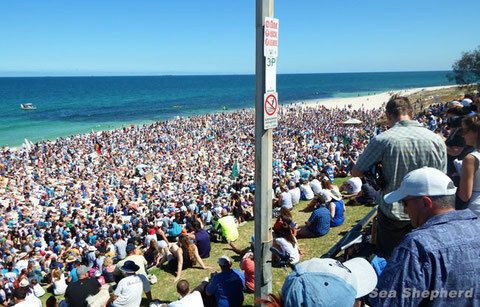 ‘‘This is the first shellfish reef restoration project in Australia, as far as we know,’’ he said. Drum lines will not be deployed off WA beaches this summer after the state's Environmental Protection Authority (EPA) advised against extending the Government's controversial catch and kill shark policy. Sea Shepherd would like to congratulate and acknowledge supporters, the general community, the “No WA Shark Cull” movement, all the people that attended the rallies, EDOWA, the shark scientists, the Greens, Labor, select Liberal MPs and the numerous conservation groups that kept the pressure and the focus on ensuring that in the end logic, public opinion, science and sense would prevail for our oceans. Researchers from the Australian Institute of Marine Science (AIMS) and the CSIRO have conducted a global literature review examining how better land management in upstream catchments helps to protect coastal coral reefs from agricultural pollution. The research is published in the UK peer reviewed journal, Marine Pollution Bulletin today. “Our research has shown that coral reefs will benefit from improved river and catchment management. By looking at examples where better managing agricultural pollution has improved coastal water quality worldwide, we now understand how better to protect coastal rivers and coral reefs,” said AIMS Marine Ecologist, Dr Frederieke Kroon. While climate change is considered the most serious risk to coral reefs around the world, agricultural pollution threatens approximately 25% of the total global reef area. With agricultural land use currently being the main source of sediment and nutrients delivered to the Great Barrier Reef Marine Park, the scientists hope that their findings will inform improved management of land-based pollution. Based on their findings, the scientists suggest that targeted regulatory approaches and upscaling of catchment management will assist the protection of reefs. They also suggest that long-term maintenance of scientifically robust monitoring programs is critical to ensure that better management results in desired improvements of downstream coral reef ecosystems. “Our research has shown that coastal water quality and ecosystems will benefit from improved agricultural management in upstream catchments. By looking at examples where agricultural management has improved coastal water quality and ecosystems around the world, we can now better inform catchment management for future protection of coastal coral reefs,” Kroon said. Examples from the research of worldwide projects demonstrate that transformative change in river and catchment management for better outcomes for coastal ecosystems is achievable. In China, for example, implementation at large spatial scales of land terracing, tree and grass planting, and construction of sediment trapping dams has decreased sediment fluxes in the Yellow and Yangtze basins. “Similar transformative change in tropical river and catchment management will improve coastal water quality and increase the resilience of downstream coral reefs in the face of climate change,”.Kroon concluded. AIMS scientists together with a team from The University of Western Australia, CSIRO and the University of San Diego have analysed coral cores from the eastern Indian Ocean to understand how the unique coral reefs of Western Australia are affected by changing ocean currents and water temperatures. The research was published today in the international journal Nature Communications. The findings give new insights into how La Niña, a climate swing in the tropical Pacific, affects the Leeuwin current and how our oceans are changing. "Due to the lack of long-term observations of marine climate we used long coral cores, with annual growth bands similar to tree rings, to provide a record of the past. We obtained records of past sea temperatures by measuring the chemical composition of the coral skeleton from year to year. This showed how changing winds and ocean currents in the eastern Indian Ocean are driven by climate variability in the western tropical Pacific Ocean," said Dr Jens Zinke (Assistant Professor at the UWA Oceans Institute and AIMS-UWA scientist). 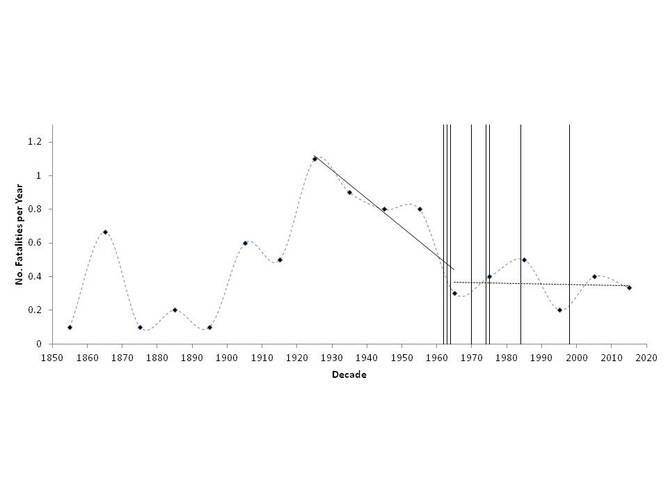 The long coral records allowed the scientists to look at these patterns of climate variability back to 1795 AD. La Niña events in the tropical Pacific result in a strengthened Leeuwin Current and unusually warm water temperatures and higher sea levels off southwest Western Australia. "A prominent example is the 2011 heat wave along WA's reefs which led to coral bleaching and fish kills," said Dr Ming Feng CSIRO Principal Research Scientist. The international team found that in addition to warming sea surface temperatures, sea-level variability and Leeuwin Current strength have increased since 1980. The coral cores also reveal that the strong winds and extreme weather of 2011 off Western Australia are highly unusual in the context of the past 215 years. The authors conclude that this is clear evidence that global warming and sea-level rise is increasing the severity of these extreme events which impact the highly diverse coral reefs of Western Australia, including the Ningaloo Reef World Heritage site. "Given ongoing global climate change, It is likely that future La Niña events will result in more extreme warming and high sea-level events with potentially significant consequences for the maintenance of Western Australia's unique marine ecosystems," said Dr Janice Lough, AIMS Senior Principal Research Scientist. 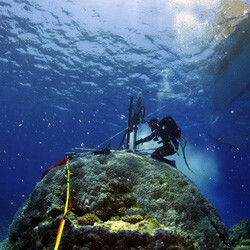 The researchers used core samples of massive Porites colonies from the Houtman-Abrolhos Islands, the most southerly reefs in the Indian Ocean which are directly in the path of the Leeuwin Current. Using the chemical composition of the annual coral growth bands they were able to reconstruct sea surface temperature and Leeuwin Current for 215 years, from 1795 to 2010. Mark Spalding is a senior marine scientist at The Nature Conservancy. My colleagues and I have worked out how much carbon there is in the world's mangrove forests, give or take a bit. And we mapped it. And here's why these findings are tremendously important. They quantify what some of us in marine conservation have been saying for a decade or more: that mangrove forests are among the most carbon rich habitats on the planet; and that, although they occupy just a fraction of the world's surface, they pack a punch. Anyone concerned about preserving nature's value - carbon sequestration and all the other benefits mangroves provide us - needs to think hard about this. Mangrove. Photo: Vincent Chaigneau via Flickr.com. 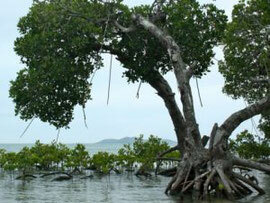 Because on average, mangroves have double the living biomass of tropical forests overall. 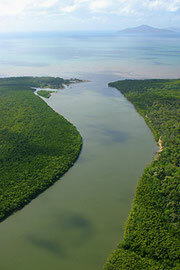 This means that if you want to slow carbon emissions, one of the first places you could look would be in the mangroves. Have you ever been snorkelling or scuba diving on a windy day when there are lots of waves? Did you notice how much that flow of water against your body affected your ability to swim and control your movements underwater? Well, fish feel the same way! Water flow, in waves and currents, plays a huge role in determining whether fish can survive in freshwater or marine habitats. Some species, such as tuna or salmon, are designed for high speed swimming, and thrive in fast flowing water. Others, such as pufferfish, are not so well equipped to handle the challenges of living in high flow environments, and prefer the peace and calm of sheltered lagoons. But even good swimmers have their limits. For example, high rates of water discharge from hydroelectric dams can hinder the upstream movements of fish – think of North American salmon or Macquarie perch in Australia. Not all individual fish are affected the same, of course. Bigger, stronger adults are generally more capable of fighting against strong currents, but smaller, younger fish will be less likely to make it. This has obvious consequences for the age structure and survival of fish populations in the long run. On the Australian coastline, waves created by winds are a major physical force that fish have to contend with. 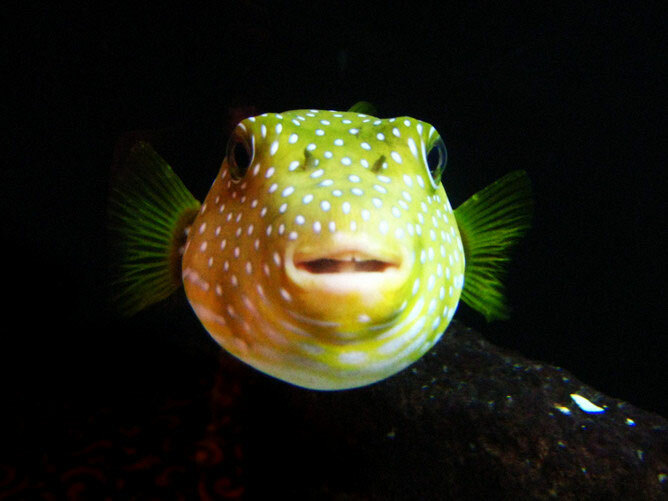 Some fish species are “rovers” without a fixed home range, and constantly swim over large areas in search of food or mates. Examples include species of surgeonfish and parrotfish. Since they do not need to defend a territory, these fish can take advantage of waves to help them move around, much like surfers do. In contrast, many other species, such as damselfish, have small territories that they defend vigorously against unwelcome intruders to protect their food and other resources. To do this, they constantly have to swim against the water flow to avoid being swept away. Colleagues and I have found that fish spend a lot more energy when they have to swim against big waves compared to a regular, steady current at the same average speed. This makes sense: humans also burn a lot more energy during interval training (when constantly changing between a sprint and a jog) compared to running at a constant speed. 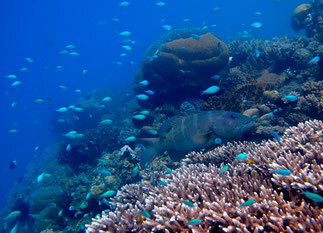 Many fish species regularly face these challenges, especially on Australia’s Great Barrier Reef. 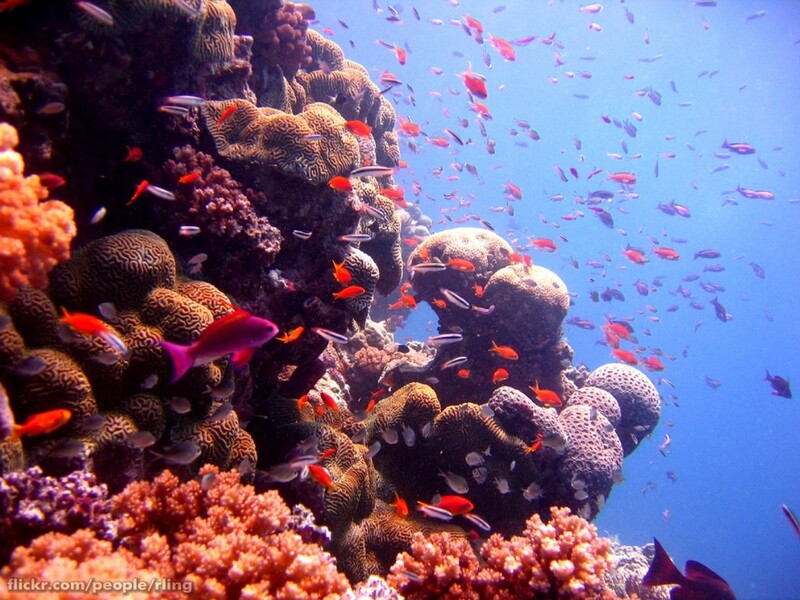 Coral reefs are shallow habitats because corals need light to photosynthesise and produce their food. Because of their proximity to the surface, coral reefs are often very wavy habitats. This poses a real challenge for the estimated 25% of marine species found on coral reefs, 4,000 of which are fish. Researchers are increasingly concerned that accelerating changes in weather patterns are affecting fish and other aquatic organisms. Rivers, lakes and coastal habitats are ecologically, socially and economically important places, so it’s worth investing the time to research the impacts of climate change on these areas. If waves are costly for some fish, then why don’t they move to calmer locations? Fish can swim, after all. And some won’t even have to swim very far to reach calmer waters. Water velocity can vary across very small scales on coral reefs. 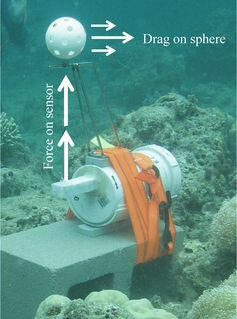 A new underwater instrument was developed at James Cook University to measure wave forces on the sea floor. A study from January this year using this device showed that water speeds decrease dramatically the deeper you go on coral reefs at Lizard Island. On a windy day, the water flow speed at 9m below the surface is about one quarter of the flow speed at 3m depth. good places to live are at premium on coral reefs and species are all vying for space. This means that fish wanting to move will have to compete with already established residents and dislodge them if they want to take over their homes. Our understanding of how fish deal with waves, let alone adapt to changes in their flow environment, is very limited. Answers to many important questions remain elusive – what aspects of their shape, physiology and behaviour allow certain species to thrive in their current habitats? How do waves affect important phenomena like the outcome of predator-prey encounters, competition between individuals, or the survival of small, larval fish on the reef? How does water flow interact with other stressors like temperature changes, ocean acidification and fishing pressure in shaping our changing marine communities? Ultimately, more research into these questions will help us understand how fish might respond to expected changes in their flow environment. These answers will be critical to inform marine resource managers and help them identify and target species that are especially sensitive to increases in wave intensity. Dominique Roche receives funding from the Australian Research Council Centre of Excellence for Coral Reef Studies. Drum lines and shark catches graph Click here to open in new window. Queensland shark fatalities at beaches with drum lines graph Click here to open in new window. 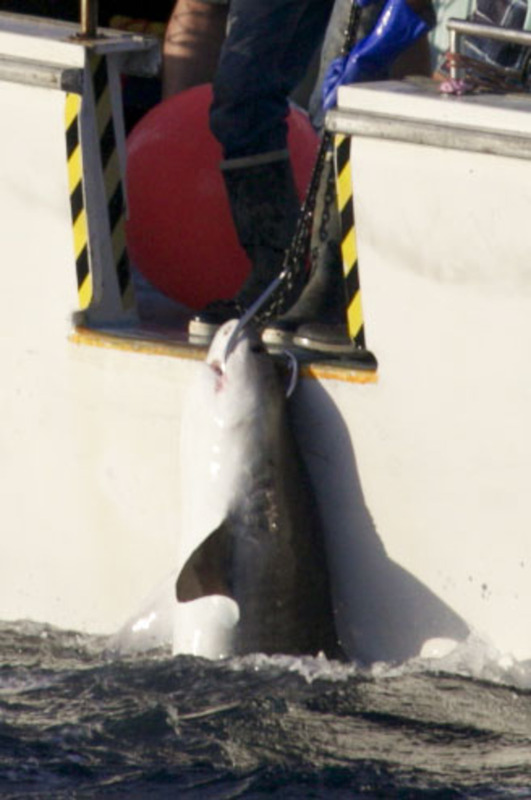 1.8m tiger shark hooked on a drum line off south-west Western Australia. Correction: data labelling in interactive maps was amended February 23.